The European Convention on Human Rights and Fundamental Freedoms was signed in 1950 and came into force in 1953. It is based on the Universal Declaration of Human Rights proclaimed by the General Assembly of the United Nations on 10 December 1948. The Convention was prepared by the Council of Europe: its aim was, and remains, to protect and enforce the human rights upon which depend the fundamental freedoms "which are the foundation of justice and peace in the world". 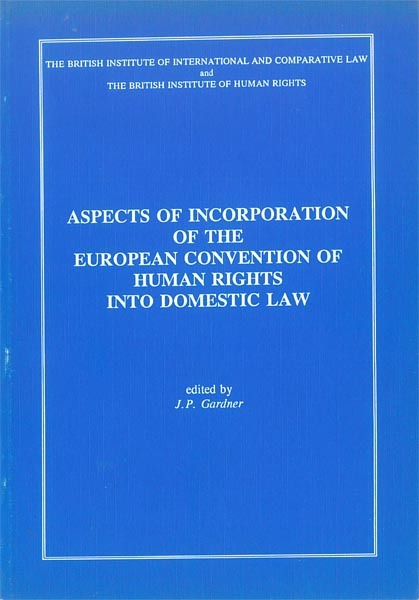 The present volume arises from papers given at a Conference organised jointly by the British Institute of Human Rights and the British Institute of International and Comparative Law, held in May 1991 on 'Aspects of Incorporation of the European Human Rights Convention into Domestic Law'. The purpose of the Conference was threefold: first, to examine the content of the obligations which the Convention itself imposes and the way which the case-law of the European Commission and Court of Human Rights in Strasbourg reflects the practice of Member States of the Council of Europe which have and have not incoporated the Convention into their domestic law; secondly to examine the approach to incorporation in some of the other Member States of the Council of Europe; and, thirdly, to review the treatment of the Convention in English domestic law and the responses which the United Kingdom has made to the particular requirements of the Convention. "Aspects Incorporating ECHR into Domestic Law"